Wow-I can’t believe we are almost in 2019! 2018 was a very creative year for me! To get some perspective, last year at this time I didn’t even have this website or much of an online presence to speak of. Thanks to Lily Weitzman I have this beautiful site. Lily has been great with the back end of things and sharing her expertise on all thinks Squarespace. Also a big thanks to Jessica Molnar I even have a new shop added just this month! Also this year I began teaching ‘again’, began exhibiting ‘again’, joined and was active in Get Messy, Newburyport Art Association, and the Monotype Guild of New England. Plus, I blogged and have sent an e-newsletter weekly since February. 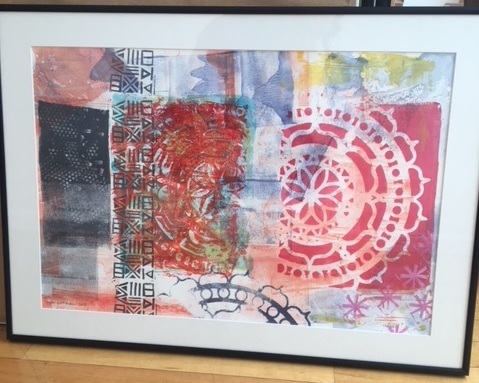 I participated in four exhibits: Newburyport Art Association Printmakers in August, Monotype Guild of New England New Members Show in October, Rhythm Cafe holiday show in Nov/Dec, and Amesbury Cultural Council Show in Nov/Dec. I have plans for four shows already under way for 2019. A goal is to double the number of exhibit opportunities next year. I taught four classes this year; my friend Ana Campos over at Circle of Stitches got me started with blockprinting in February and then a Phases of the Moon class at her shop in October. I also taught at my church and two classes at the Newburyport Art Association. I also filmed two Two online tutorials with Get Messy! I have five teaching engagements lined up already for 2019 - one is a retreat… more to come on that! I just counted and I made 13 YouTube videos this year! This is funny, because I was setting a goal of one a month for 2019 and when I saw that I made 13 in 2018 I realized the 2019 goal needs to change…. Finally, I love hanging out on Instagram with my 500+ followers (wow!). I celebrated that milestone with a print giveaway which was fun. I’ve been posting almost daily, participated and completed the 100 Day Challenge, Inktober, and am in the middle of Carve December. Accountability challenges are my jam! A big thank you to everyone reading my blog, buying art, taking classes, and supporting me on social media this year! Here’s to an awesomely creative 2019! As the year winds to a close it has become a tradition for me to get involved in Carve December. 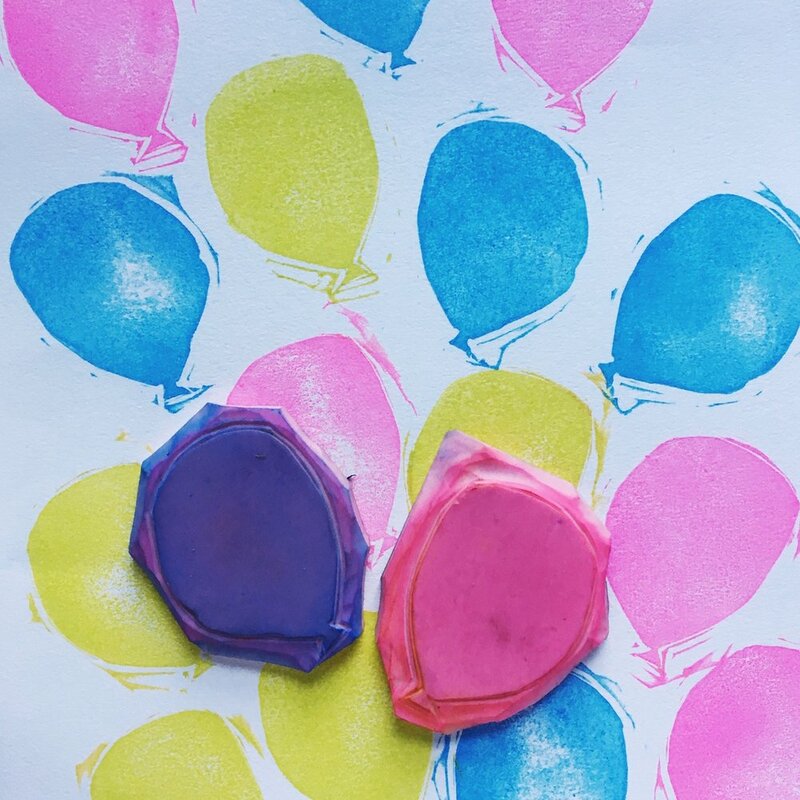 This is an instagram challenge planned by Julie Fei-Fan Balzer, an amazing artist and author of Carve, Stamp, Play. I share her book as a resource in my blockprinting classes. Why another challenge? I really believe that these challenges have moved my work forward. Last year I participated in this challenge and since then I have started teaching in-person blockprinting classes. Other challenges this year, the 100 Day project and Inktober, both pushed my style forward. I am excited for what has yet to bubble up there. So, I think challenges can be hard, but also so good. You can’t help but see progress with a daily art-making practice. For this year’s #CarveDecember Julie has provided some prompts for the month. So far I am going along with them; that is a first for me, usually I follow my own whims. I want to try to make two-color stamps, but of course that means I have to make more than one stamp. Some days that just might not be possible. I am also interested in trying a stamp that connects to itself to make a larger image. That requires some careful measuring… we will see what the month brings. For now, here are my stamps from the first few days. Please follow me on Instagram for the daily updates!